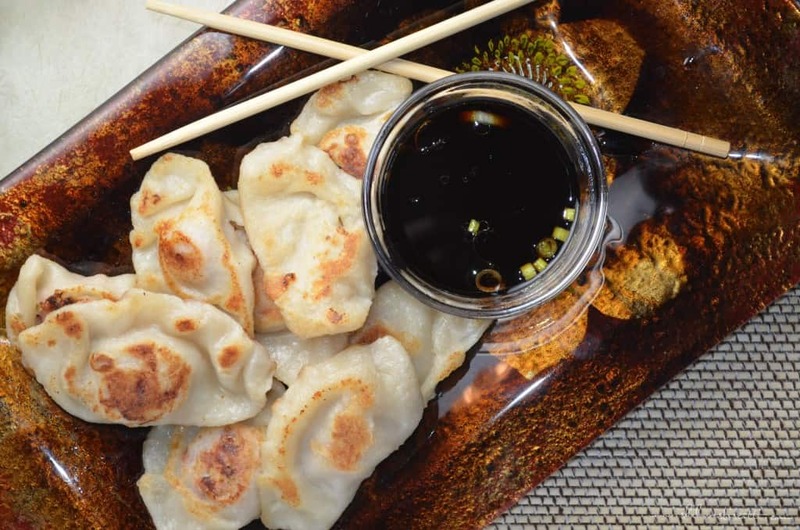 There’s nothing like these easy homemade Chinese Pot Stickers to welcome the Chinese New Year. According to the Chinese Zodiac, the year 2019 is the year of the pig. Let the celebrations begin! Did you know that according to some Chinese culinary traditions (especially Nothern China), there are some foods which are considered good luck when consumed on the eve of the Chinese New Year? One such food are the extremely addictive pot stickers. According to folklore, a chef to the royal family left his dumplings a little too long on the heat and as a result, they were slightly overcooked on one side. In an effort to hide his error, he presented them to his superior as a new recipe. Hundreds of years later, we still can’t get enough of this food, which was created by mistake. There’s a little bit of work in making these dumplings, but don’t let that discourage you. Once you taste them, you’ll want to make them again and again-they’re that good. 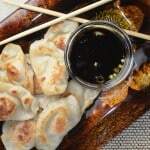 Enlist the help of family and friends and have a pot stickers-making party. 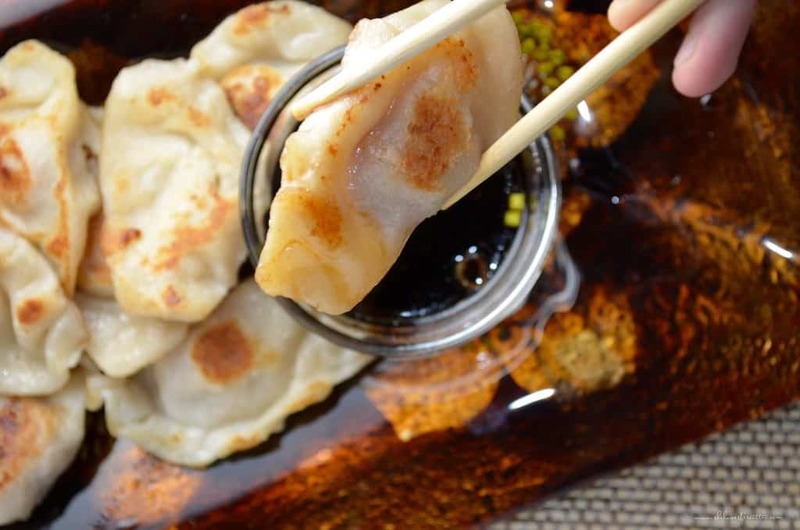 You’d be amazed how much fun can be had by making these easy homemade Chinese pot stickers. Keep in mind that the whole process becomes a lot easier if you divide it into steps. The first thing you want to do is make your dough, otherwise known as the pot sticker skin. While the dough is resting, combine the ingredients for the filling, roll into balls, place on a cookie sheet and refrigerate. Now, back to the dough. Divide your dough (as indicated in the recipe) and with a rolling pin, create circles about 4 inches in diameter. The next time I make them, I will try to roll out the dough a little thinner. If dough making is not your thing, they are readily available in the frozen section of your grocery store. Great, so you are now ready to combine the filling with the pot sticker skin. It’s time to make the dumplings! At this point, I will direct you to a real expert to help you get that characteristic shape of the pot sticker. Take a look at this you tube video where 8 different ways of folding the pot sticker are shown. Seems easy enough, right? What I’ve learned is that you only need to dampen one half of the wrapper with water. This will serve as the “glue” to firmly enclose the filling. Also, when you fold over your wrapper, make sure you remove any air pockets. You need a nice seal to avoid the pot sticker falling apart during the steaming process. No one wants a deconstructed pot sticker. Alright then, we’re at the homestretch. There are different ways to cook these little gems. You can stir-fry them and then add a little bit of water or broth. I prefer to steam or boil them first and then pan fry them later to get that sought-after crispiness texture. Then, only thing left to make is the dipping sauce. My daughter recently spent a semester studying abroad in Ireland. While she was there, she had two roommates who were of Chinese origin, Xin and Mengdan. The girls looved cooking, and my daughter tells me that, every weekend, they would share a recipe with her and that they would then all eat and enjoy together. Pot stickers were the first thing they all made together. Needless to say, my daughter was eager to share her newly acquired skill. So my daughter, my daughter-in-law and “moi” spent Sunday afternoon making and eventually eating Chinese dumplings. I thought it would be interesting to substitute the minced pork and shrimp with Italian sausage. And you know what? The taste was amazing, regardless of the less than perfect look of the dumplings! You can actually use any combination of meats in the filling, or make them totally vegetarian – the choice is entirely yours to make. And these are so convenient, too! You can freeze them, if you like, and have them for dinner, later, on those evenings when you just don’t feel like cooking. Wishing all of my Chinese friends a Happy New Year! 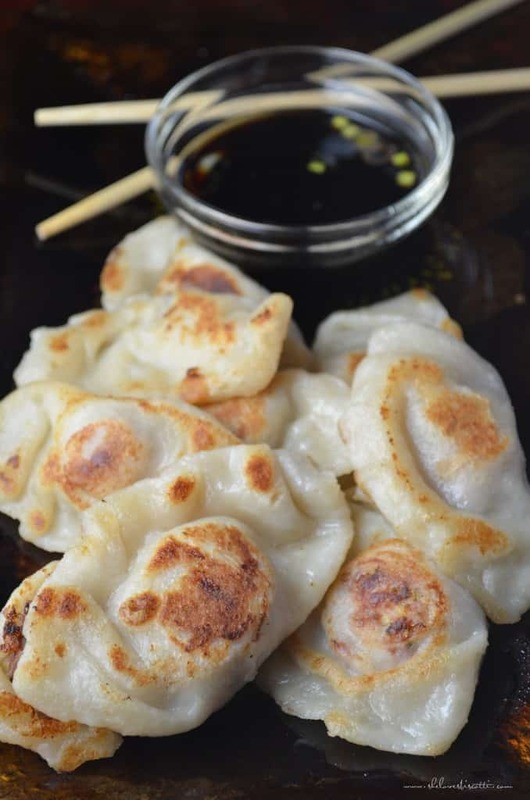 There's nothing like these Easy Homemade Chinese Pot Stickers to welcome the Chinese New Year. Steamed or pan-fried, betcha can't eat just one! In a large mixing bowl (of stand mixer) combine flour with water. Mix with dough hook until smooth and elastic, about 5-7 minutes. If dough is too soft, add some flour. Alternately, knead by hand. Wrap each half in saran wrap and let it rest for at least 30 minutes. Add salt to shredded cabbage. Toss to combine and set aside for 5 minutes. In a large bowl, combine shrimp, pork and seasonings. Mix well to combine. Squeeze out the liquid from the cabbage. Add to meat mixture and mix well. With a small ice cream scooper portion the mixture (about 1 tablespoon) and place on a baking sheet. Continue to portion all the mixture. If desired, with slightly damp hands, roll into balls. Refrigerate until ready to combine with the pot sticker. When ready to make the pot stickers, roll each half of dough into a 12-inch log. Each log should make 24 pot stickers. So, start by cutting in half. Cut each half again in half. Cut in quarter evenly in 6 pieces. You should have 24 pieces. Repeat with other half of dough to make 48 pieces. Roll each piece of dough in a 3-4 inch circle. Keep them covered with saran so that they do not dry out. Once the pot stickers have been rolled out, place the filling on the wrapper. Brush water on half of the outer edge of the pot sticker skin. Seal while pressing out the air. Drop a few pot stickers at a time in boiling water and cook for about 5-7 minutes or until cooked. If desired, can be pan fried in oil until crisp. I substituted the minced pork and shrimp with Italian sausage with amazing results. 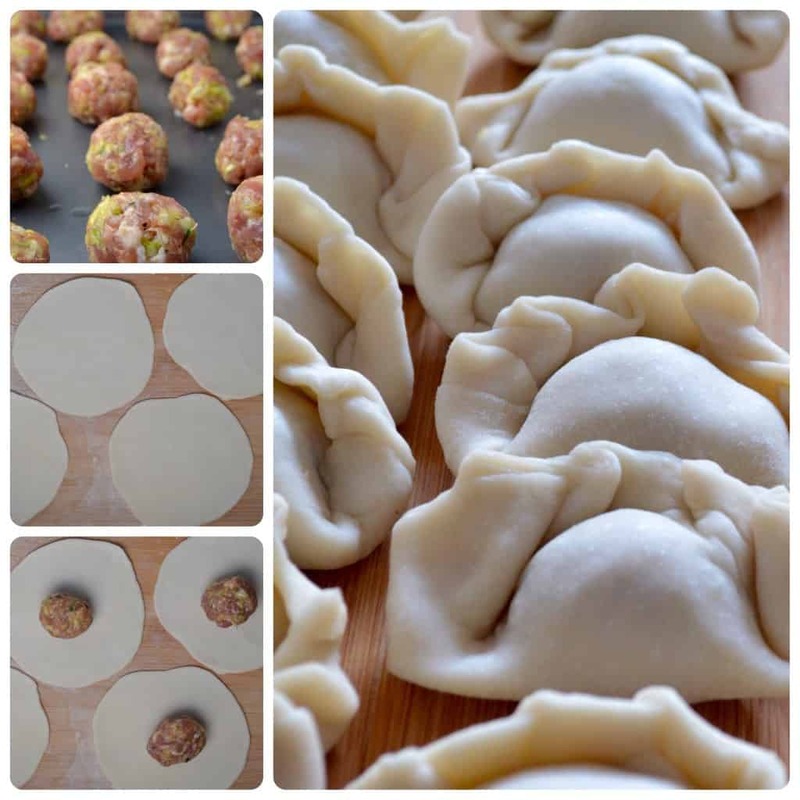 These pot stickers are handy to have in the freezer, just make sure you freeze them individually ( on a sheet pan) before placing them in a bag as the dough is very soft. For the dipping sauce, combine 2 tablespoons of soy sauce, 1 tablespoon of rice vinegar, 1/2 teaspoon of sesame oil and about 1 teaspoon of minced scallion. Adjust the quantity for larger crowds. I just love pot stickers… can’t wait to try them. Thanks. I do too! Hope you enjoy them as much as we do. Thanks so much for stopping by, appreciate your comment.